THE President of Namibia, Dr. Hage Geingob has reacted with shock and dismay at the cold blooded double murder of Namibia Institute of Mining and Technology (NIMT) executive director Eckhart Mueller and NIMT deputy director, Heimo Hellwig. 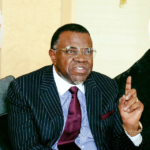 Dr. Geingob, in an official statement on the matter, expressed his shock and sadness when learning about the untimely death of the victims. The President also conveyed deepest condolences to the family, colleagues and friends of Mueller and Hellwig. President Geingob lauded the late Mueller for his stellar contributions towards the progressive realisation of the technical and vocational education and training landscape and development of young people in Namibia. In the meantime the Namibian Police have launched a country wide manhunt for the person who murdered Mueller and Hellwig when they arrived at the administrative building of the NIMT Campus in Arandis early on Monday morning. The murderer fired eight shots at his victims from a nine millimetre pistol at close range. Both the murder victims sustained gunshot wounds to their torsos and to their heads.